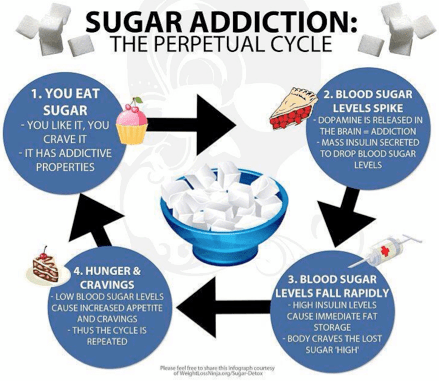 For those of you new to my blog, I am a huge believer in quitting processed sugar. Before switching to a whole food diet, I was a HUGE sugar addict. I dumped tons in my coffee, loved cookies and cakes and even had a little stash of jellybeans in the car. I never had a weight problem, but I always had that extra 5-7 lbs that I just couldn’t seem to lose. When I quit processed foods and sugars, I lost weight without even trying! Since then, I never count calories and stay at 122 lbs. I haven’t been this thin since before I had my babies! Sugar is an awful drug that makes you want more and more. Once you kick it, you will no longer crave it. I promise. Here are some tips that may help you. 1. Start reading labels. Most all processed foods contain high fructose corn syrup or some other form of processed sugar. To see a list of additives found in processed foods, click here. 2. Take it out of your coffee. This was the first step I took. The first few days were a bit rough, but then I got used to it and actually like my coffee better with just some milk. 3. Swap out your flavored yogurt for plain, whole fat yogurt. Most fat free or low fat yogurts contain extra sugar to make them taste as good as their full fat equivalents. Not to mention the chemical process that takes place to remove the fat. Once you are eating plain yogurt, you can add in your own raw honey or fresh fruit to sweeten it a bit. 4. Look at your milk. Milk, especially the flavored kind, can contain a high amount sugar. This goes for dairy and non dairy. I know for non dairy, you can buy the plain or unsweetened version. If you need a little flavoring, you can add a bit of vanilla extract to it. 5. When baking, swap out processed sugars for less processed sweeteners like honey, maple syrup or coconut sugar. Beware of so-called healthy sweeteners like agave. You can read this post to find out why it’s not as healthy as it seems. These three sugars are mostly processed in nature. You can even cut the sugar in most recipes and the dish will still be plenty sweet. To read my full breakdown on sweeteners, click here. 6. If you are a soda drinker, slowly cut down your consumption until you have quit for good. Don’t replace soda for diet soda either. In my opinion, diet soda is even worse. Stay away from Vitamin Water as well. It contains almost as much sugar as a can of coke! You can read more about that here. 7. Catch up on your reading. There are several books that can explain the dangers of sugar. One I recommend is The Sugar Fix: The High-Fructose Fallout That Is Making You Fat and Sick . Another book that explains the dangers of artificial sweeteners is called Sweet Deception: Why Splenda, NutraSweet, and the FDA May Be Hazardous to Your Health . 8. Start using spices and some foods to make your food seem sweeter without adding any sugar. Some of those include: cinnamon, vanilla, nutmeg, applesauce and avocado. I swear this is true and I can personally tell you that this vanilla powder is worth every penny. I add it to everything and it really does make a difference! 9. When looking at nutrition facts, try to keep your sugar grams under 5 per serving. 4 grams of sugar = 1 tsp. It’s good to keep that in mind when looking at labels. 10. If you get a craving for something sweet, try drinking a glass of water or brushing your teeth. You might notice it disappear afterward. Even baby steps that you take can make a big difference. Maybe you can pick just one of these at a time and start. I will leave you with this picture that explains what sugar does when you eat it.